Drawing from linguistics, psychology, physiology, and physical science, the field of communicative sciences and disorders is dedicated to understanding and minimizing the impact of disordered speech, language, hearing, and swallowing processes in children and adults. This master of science curriculum combines coursework with supervised clinical experiences and a supervised practicum in which you’ll work with individuals from culturally and linguistically diverse background with various severities of communication-related disorders. The program leads to eligibility for professional licensure as a speech pathologist. You can choose to pursue this degree with a bilingual extension (see below). An online program is also available. Please note that you must apply to the online program through a different application portal. *Applications (including all materials) must be submitted by January 1 to CSDCAS. ** See early action option for current NYU CSD undergraduates below. Each year, NYU Steinhardt’s Department of Communicative Sciences and Disorders welcomes several dozen college graduates from science and other liberal arts backgrounds from across the country to join its MS program. If you do not have a background in communicative sciences and disorders, you may have to take additional coursework. Audiology is not offered at the master's level. The Admissions Committee reviews applications holistically, and the GPA requirement is one of many factors that will affect your admissions decision. Candidates can only have one active application to NYU Steinhardt during each admission cycle. In other words, candidates can either have an on-campus application open or an online application open, but not both. This application is for the on-campus program only. Current students in NYU Steinhardt's undergraduate program in CSD (majors and minors) now have an option to apply for early admission into the MS program. The application deadline for early admission for the Fall semester is November 15th, please apply through the CSDCAS portal by the stated deadline. Students who select this option will be informed of their admission decision at the end of December. If you are given early acceptance into the program, you will still have until April 15 to submit your deposit. Financial aid packages will not be fully available until mid-March. NYU Steinhardt's CSD undergraduates are not required to apply for early admission and can also submit their graduate application on the regular admission date of January 1. Candidates who have previously applied to New York University's Master of Science in Communicative Sciences and Disorders Program (on-campus or online), are required to submit a supplemental essay in addition to the standard application materials. 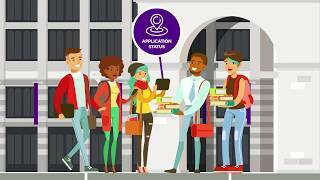 Additionally, candidates must disclose prior applications and decisions from NYU on any future applications to NYU regardless of the modality of their prior application. Please see the essay prompt in the Prepare your Application section. Your application will require the following items. You will apply through CSDCAS (the Communication Sciences and Disorders Centralized Application Service). You do not fill out a separate NYU Steinhardt graduate admissions application. Your application will require the following items: Personal Essay, CV/Resume, two Program Essays. If you are re-applying, a supplemental essay is required. Unless otherwise stated, all documents should be double-spaced, 11 point font or greater with 1-inch margins. Each applicant can upload a total of 5 MB per document. The accepted file formats are MSWord (.doc, .docx), Rich Text Format (.rtf), Portable Document Format (.pdf), and ASCII Text file (.txt). Your personal statement explains your purpose in undertaking graduate study in this particular program. This is your opportunity to introduce yourself and to inform the Admissions Committee about your goals, interests, and career plans as they relate to your intended academic pursuits. Be sure to include your name on each page of your statement. 2 pages maximum. Please upload a copy of your most recent résumé or curriculum vitae. 2 pages maximum, does not have to be double-spaced. You are required to submit a maximum of three letters of recommendation, at least two of which must come from academic sources. A professional letter of recommendation may be accepted in place of an academic source for those who have been out of school for five or more years. You will submit the names and contact information for up to three references, who will then be notified to submit letters of recommendation via CSDCAS. See detailed instructions. Request one official transcript from every postsecondary school you have attended to be mailed to CSDCAS by the institution's registrar. Make sure to request them in advance of the deadline. See detailed instructions. In order for you application to be considered complete, you must complete both Program Essays (Essay #1 and Essay #2). Essay #1: Describe a unique perspective, skill set, or life experience you have. Articulate how it might benefit your potential classmates, enhance discourse in the classroom, and/or contribute to the NYU communicative sciences and disorders community. 1 page maximum. Essay #2: Reflect on a time when you were required to prioritize multiple projects, tasks, and/ or events. Explain how your method relates to your learning style/ study habits and contributes to your current academic or professional success. How will you translate this success to our CSD program? 1 page maximum. Re-Application Essay: If you are re-applying to NYU Steinhardt's CSD Program, please briefly describe the steps you have taken to strengthen your application since your last submission. Please include when you applied and what modality (on-campus or online). 1 page maximum. Required. See detailed instructions on how to submit your GRE scores to CSDCAS. The GRE institution code for NYU Steinhardt for CSDCAS is 7449). Do not send GRE scores to NYU Steinhardt. See detailed instructions on how to submit your TOEFL scores to CSDCAS. The TOEFL institution code for NYU Steinhardt for CSDCAS is C122). Do not send TOEFL scores to NYU Steinhardt. CSDCAS does not accept official scores from the other accepted English proficiency exams. Therefore, you must upload evidence of your IELTS, and/or PTE Academic as a supplemental document in CSDCAS. If admitted, you will have to send official scores to Graduate Admissions. You will apply through CSDCAS only. You do not need to fill out a separate NYU Steinhardt application. Application deadlines are "in-office" deadlines, not postmark deadlines. It is your responsibility to ensure that all materials are submitted through CSDCAS by the appropriate deadline, and we reserve the right to return any application that arrives after the deadline. Only completed applications will be considered. Should a deadline fall on a weekend, the in-office deadline will be the next business day. We advise you to apply early. Once a student enrolls in the on-campus or online program, they cannot switch between programs. At the discretion of the Academic Adviser and the Admissions Committee, students admitted to the on-campus program may be eligible to switch to the online program prior to beginning their studies. Students admitted to the online program are not eligible to switch to the on-campus program given physical space limitations.